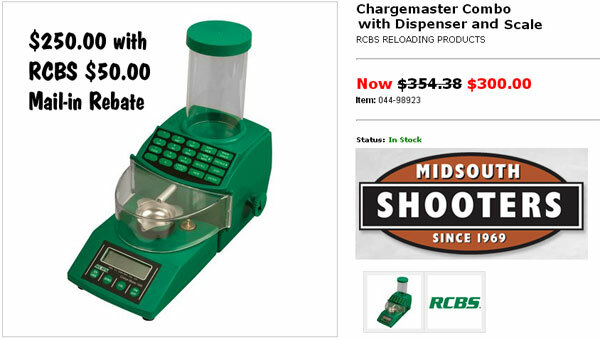 The RCBS ChargeMaster Combo Electronic Scale/Dispenser is very popular with reloaders. The units we use have dispensed loads faithfully (and accurately) for many seasons. We rarely, if ever, mess around with manual powder measures anymore. If you haven’t bought a ChargeMaster yet because the price (typically about $349.00) has been out of reach, now you’re in luck. Midsouth Shooters Supply has discounted the ChargeMaster to exactly $300.00. That qualifies for a $50 off rebate from RCBS. When you figure in the $50 Manufacturer’s Rebate, your final price (not including shipping) is just $250.00. That’s a good deal. But just to be clear — you still have to pay shipping! You can get $50.00 cash back from RCBS. You need to have purchased at least $300.00 in 2012 RCBS “Product” to qualify for the RCBS $50.00 mail-in rebate. 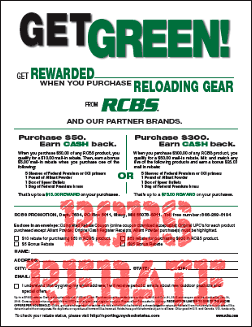 With the rebate you get $50.00 back directly from RCBS. This lowers the effective price of a new ChargeMaster to $250.00 (before shipping and after rebate). Purchases must be made between 1/1/2012 and 12/31/2012 and the rebate form and supporting materials must be received no later than 1/31/2013. Share the post "How to Get an RCBS ChargeMaster for $250.00 (After Rebate)"
I’ve used a buddy’s ChargeMaster, and you guessed it, now I want my own. This is a good deal with the $50 Rebate.